The suicide come together again to attain an asset called Resurrection Man and also kill arch villian Regulus. 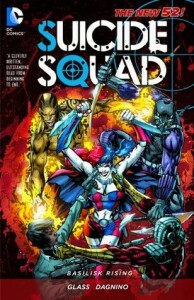 There is also an issue completely focused on Amanda Waller and how the suicide squad came to be. I couldn't remember a lot of what happened in volume 1 but this was still pretty enjoyable. Character wise Harley Quinn still somewhat steals the show although I did like King Shark as well. I really detested Deadshot in this issue, although I did enjoy his time with Captain Boomerang which mixed in a bit of humour to proceedings. Amanda Waller is still tough as nails but some back story with a family member saw her looking more human and frail. The artwork is amazing in this volume although there did seem to be some consistency problems in the second issue with how Amanda Wallers character was drawn.